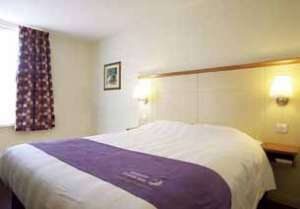 Premier Inn Cardiff West Budget HotelThe UK's number one hotel chain, Premier Inn guarantee clean, comfortable rooms and a friendly and efficient service - everything you need for a good night's sleep. All our hotels have restaurants serving tasty hot dinners and our-all-you-can-eat Premier Breakfast. Under 16s can stay and eat breakfast free. The UK's number one hotel chain, Premier Inn guarantee clean, comfortable rooms and a friendly and efficient service - everything you need for a good night's sleep. All our hotels have restaurants serving tasty hot dinners and our-all-you-can-eat Premier Breakfast. Under 16s can stay and eat breakfast free. This hotel has disabled rooms. This hotel has rooms adapted for customers with disabilities. Beds are arranged to enable easy access. Please note all rooms are subject to availability.